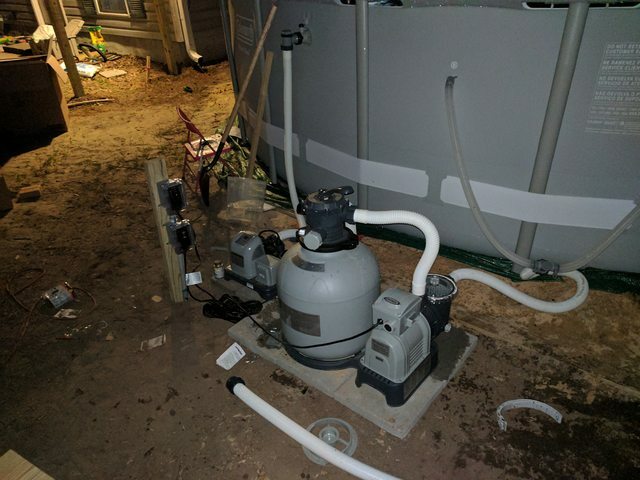 New pool setup with upgraded pump - My journey begins! I’ve been on here off and on asking a little bit, but now I am actually doing it and wanted to share. You can laugh or cry at what I’ve done, either one is ok. I started out looking at a $90 Summer waves 10ft pool at big lots but it has now turned into a $9k investment. I will give a breakdown of what I have done, and I'll throw in up some pictures. I also have a few questions. 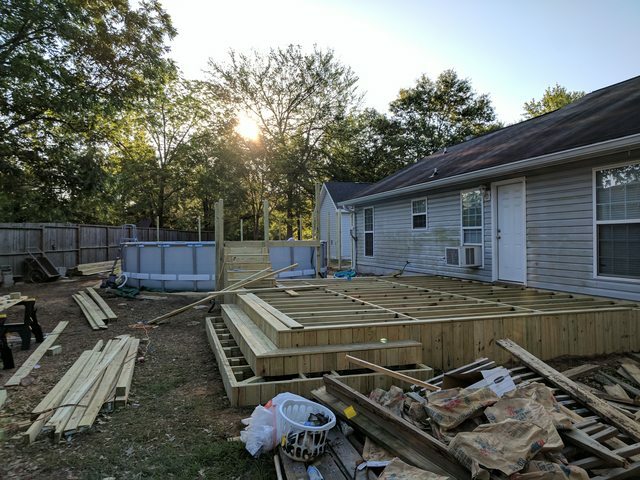 I started out with a $7800 budget but redoing my deck cost a lot more than I thought. *The prices you see for the lumber/material are a reflection of my dad running a building supply store. I get everything at cost plus 15%. 1. 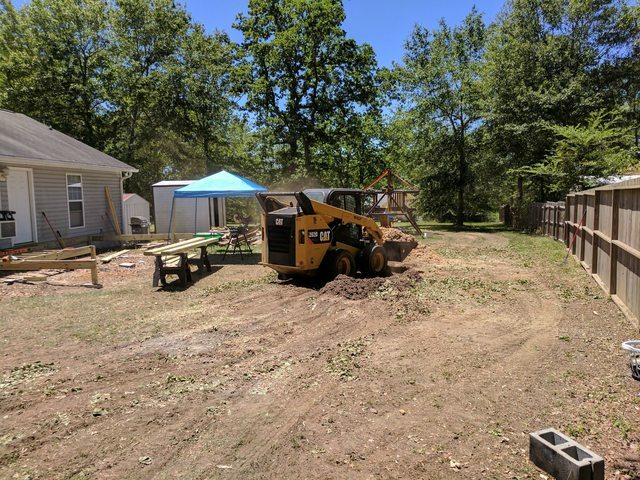 I took down 3 oak trees ($1100). Due to space restraints, they had to come down with a bucket truck, thus the price was much higher. Quoted $1500, but they came down a lot to price war a few other companies. 2. 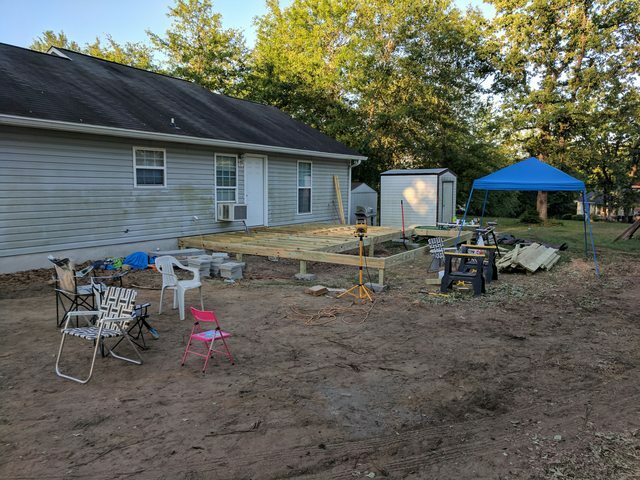 Replaced my 10x12 deck (aprox $2k) that was starting to fail anyway and I am now finishing up an 18x20 with a step up to a 5x8 pool height deck. This was a MUCH bigger job than I thought, and my brother wanted to make it fancy. He came down from out of state for a week and helped to build it. His wife also helped a lot. It looks great but cost me a lot more money. I should be done with it tonight. 3. 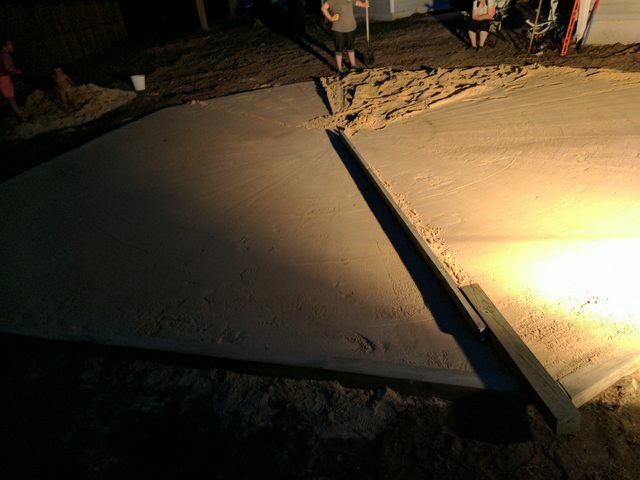 Setup pool sand foundation. I was going to dig down(as suggested here). I had the tree guy use his bobcat to peel off several inches of top soil. There is a pretty good slope to my yard. Maybe a 4-inch drop over the span of my pool. However, as soon as we tried to get the ground closer to level we realized there are way too many roots left from the tree. I didn't know they spread so wide from where the tree was. So, at the last minute, and at added unexpected cost, we took 4x4s and made a border, and had sand brought in. Sand was only $75 for around 6 tons, and the 4x4s were around $115. 4. 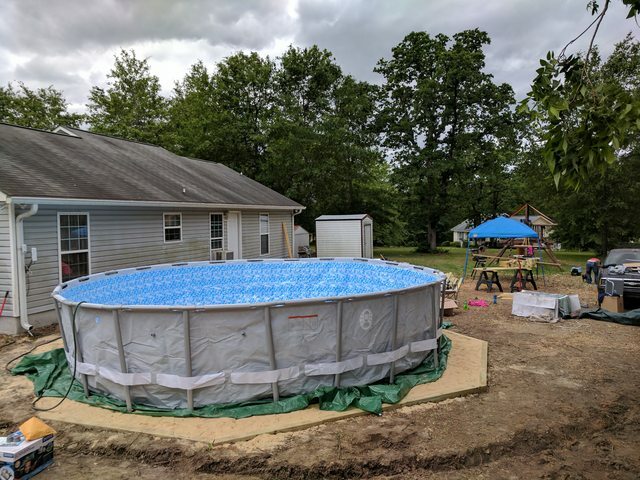 Setup a 22'x52" Coleman (Bestway) Power steel pool($519 from Walmart after 10% off thanks to my mother in law who works at one plus an added a 3-year warranty) combined with an Intex 3000GPH sand filter/pump and Intex 15k gallon SWG. (approx $278 new for the set). All hoses and attachments fit together without any issue in case anybody wonders. No modifications needed to the hoses or fittings. 5. I ran a 14 gauge extension wire from the back of my office building outdoor outlet to two outlets that are weather sealed for the SWG and Pump. This was around $60. 7. 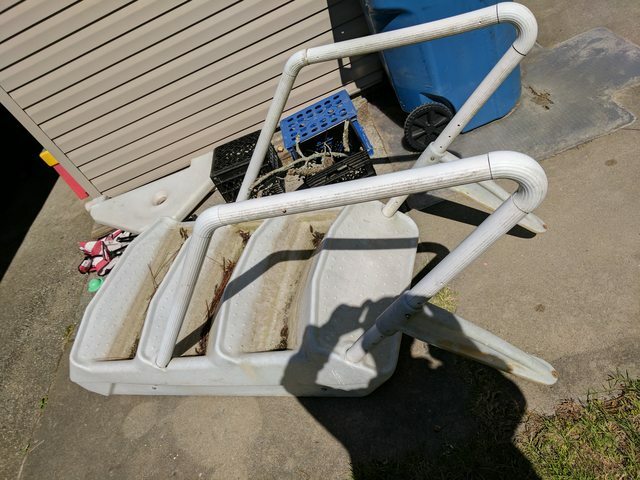 I found some pool steps listed locally on facebook yard sell. They came from a pool store, so not sure the brand or price, but they were only $75 and attach to a deck. I'll be getting to that later this week. 7. The biggest expense is the 220 feet of hand built privacy fence still going up($3600). It'll be 7 ft tall and the pickets are 14ft decking boards cut in half. To save money I am only having someone frame up the fence and put in the gates. I'll go behind and finish the fence. I have a lot of tools, but not a lot of experience or time. - How long do you wait after turning on the SWG to use the pool? I set it up last night and added sand. This evening will be 24 hours of the filter running, so I will turn on the SWG when I get home. - My gauge is borderline green/yellow from the start. Is this ok? I read some say it can be normal. I just don't want to mess this thing up. - The air release on the inlet valve is currently covered with a plastic cap. If pull it off I can see a lot of air getting mixed in. Do I need this on or off, and what is the purpose? - What do I need to check for chemical wise as the SWG works? PH level? - What would be a good way to protect the seams to avoid rust? Waterproof duck tape/gorilla tape? - Any other advice on first time pool setup and maintenance? These are some before shots. Ignore the green on the house, need to pressure was that. Pump,SWG , and electrical up. That is the same pump and filter I have. Mine tends to hover around that pressure too. Once it gets into the yellow by 2 psi I usually backwash and rinse. The pool legs are on 2x6 pieces, about 10 inches long. I wanted to use pavers but we were concerned the concrete would slowly rub holes in the liner. 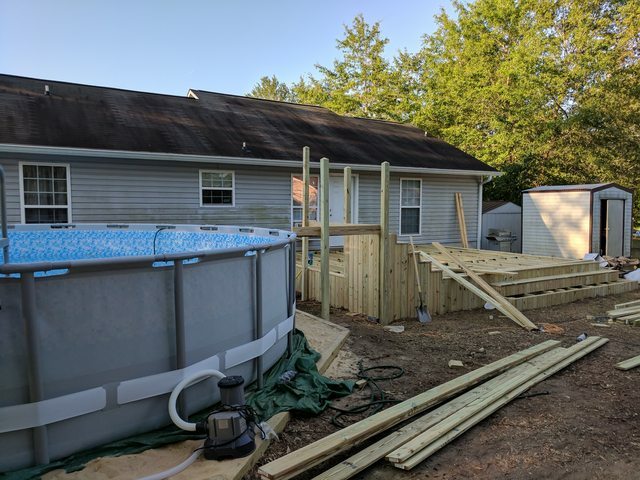 I figured the wood would last as long as the pool would (3-5 years), and by then I'd know if I wanted a professional pool with a longer warranty and maybe a bit bigger. I made sure the tarp is over the wood to be between the liner and the wood so it doesn't splinter. We'll see. I also wasn't sure if I would end up taking it down within the next year once I get a handle on this to get the wrinkles out better and level the sand some more. it's a big higher on one side, but the frame is very close. I went around leveling the top bar with a 4-foot level. that looks good. cant wait to see finished photos. Hi! Are you required in your area to bond your pool since it's over 42"? 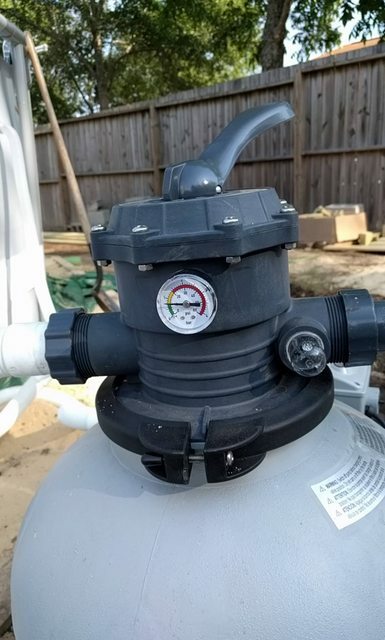 I also just bought the Intex Sand Filter and can't figure out where to attach the bonding lug to attach to the bond grid. I don't believe it's double insulated and therefor requires bonding. Any help on this one would be greatly appreciated! 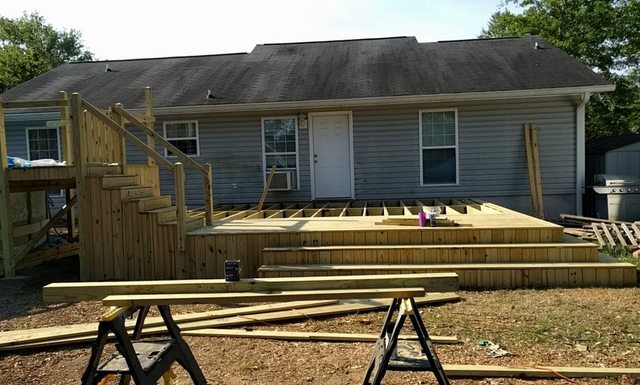 Deck looks really awesome!! I've been getting things finished here and there. 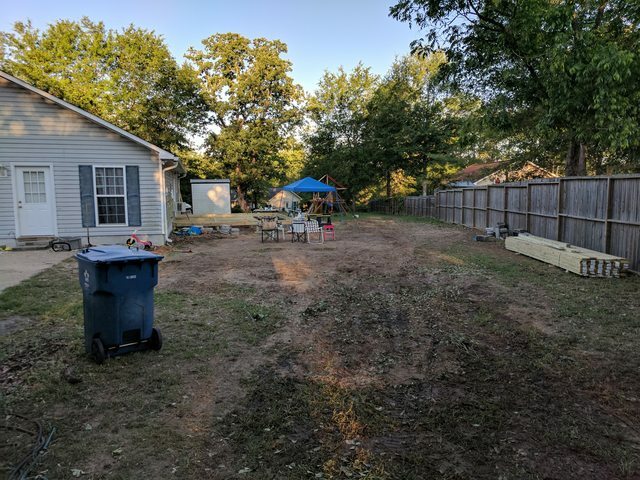 Other than waiting for the grass to grow back it's more or less done. I started wrapping the joints with white gorilla tape, but have since bought clear. I still need to finish that part. Kids are loving it. 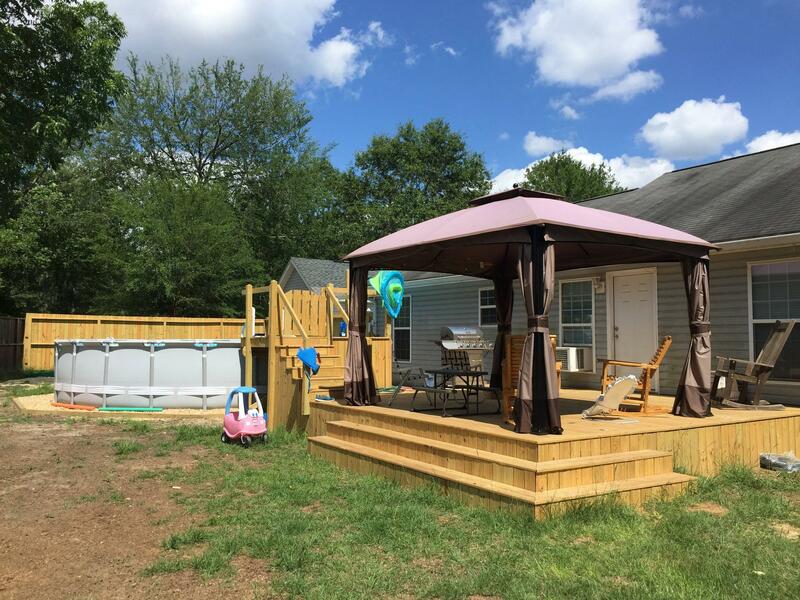 Huge deck and an awesome pool for your family = money well spent! Make sure you have a tfp test kit, and are using it. Otherwise you will end up with a great pool set up and green water. The testing isn't hard, and once you "get to know" your pool, maintenance will be easy!